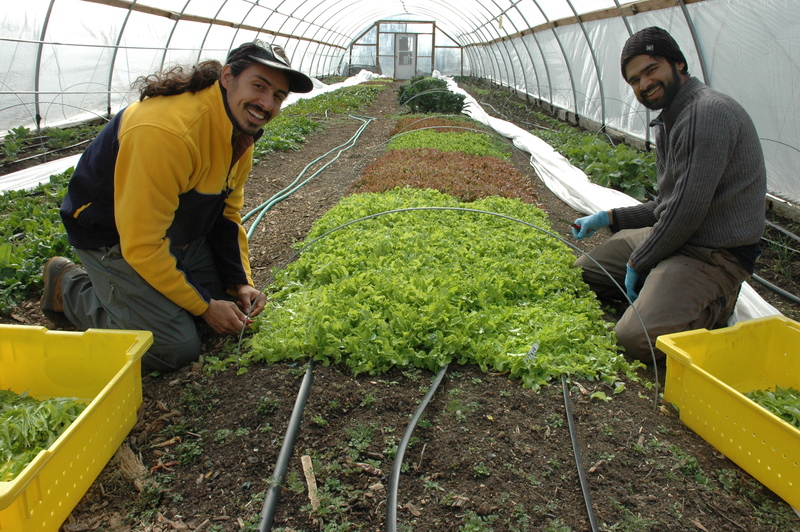 Christian Melendez and John Costa harvest oak leaf lettuce in one of the four hoop houses at ECO City Farms. With one nimble step, Christian Melendez lopes from the hat-and-mittens weather of a blustery February afternoon to temperatures more suited for a T-shirt. The 75-degree environment he enters would make any red-blooded rabbit swoon. It’s a winter refuge filled with row after row after row of chemical-free, stunningly lush and tender lettuce, raab, spinach, chard, collards, parsley, arugula and pea shoots. Melendez kneels in the dirt and deftly begins harvesting oak leaf lettuce with a serrated knife, placing fistfuls in a bright yellow crate. 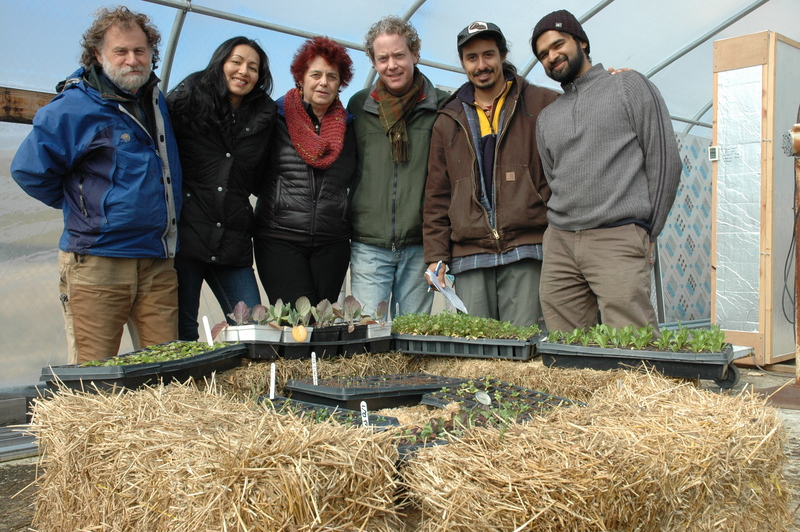 This feast of green thriving in a 95-foot long, plastic-covered hoop house is the bread and butter for ECO City Farms, a bold experiment in nonprofit, community-based, urban agriculture where Melendez serves as farm manager. Like its neighbor Community Forklift, the farm’s brainstormers intentionally selected Edmonston as their home base because of the town’s burgeoning environmental ethic and the belief that they could help to plug a gap in a working-class community notably short on such services. 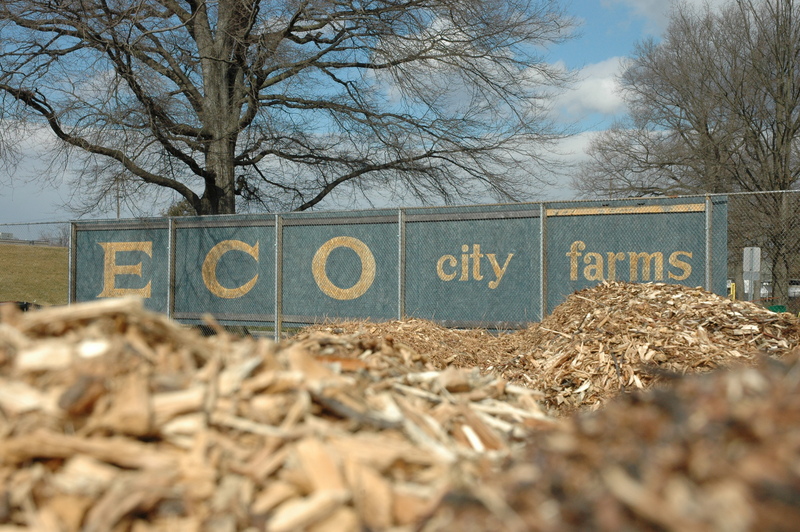 Not long ago, ECO City Farms expanded its operation to include old tennis courts, where wood chips await use. Besides having overlapping green-centered outreach and education philosophies, the Forklift and the farm also share tangible items. One example of such cross-pollination will begin on Saturday, March 23—the day of the Forklift’s annual Spring Soiree/Garden Party/Spring Sale—when the farm will set up a booth at the Forklift to sell its coveted compost, herbs and vegetable plant seedlings ready to be transplanted to buyers’ garden spaces. The two nonprofits are hoping the consignment partnership evolves into a long-term arrangement. 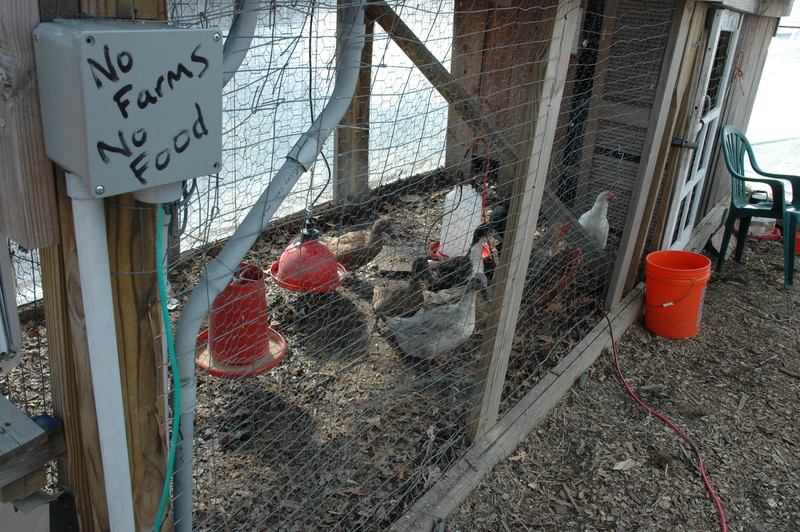 Ducks and chickens are among the denizens of ECO City Farms. The Forklift’s footprint is visible at the tidy two-acre plot ECO City Farms leases from the Maryland-National Capital Park and Planning Commission where Crittenden Street dead-ends into a park. For instance, storm doors rescued from the Forklift are the way in and out of each of the four hoop houses where crops are harvested. ECO City Farms apprentice Matthew Carucci checks seedlings that count on the warmth of a hotbox, a Community Forklift that he retrofitted, to take a growth spurt in the nursery. In the farm’s adjacent plant nursery, nets salvaged from the Forklift keep greedy birds and bugs from sneaking inside to sample the goods. Also, scraps of Forklift wire, plastic and metal have been cobbled together into a contraption that sifts compost from the farm’s impressive composting operation into a ready-to-use state. 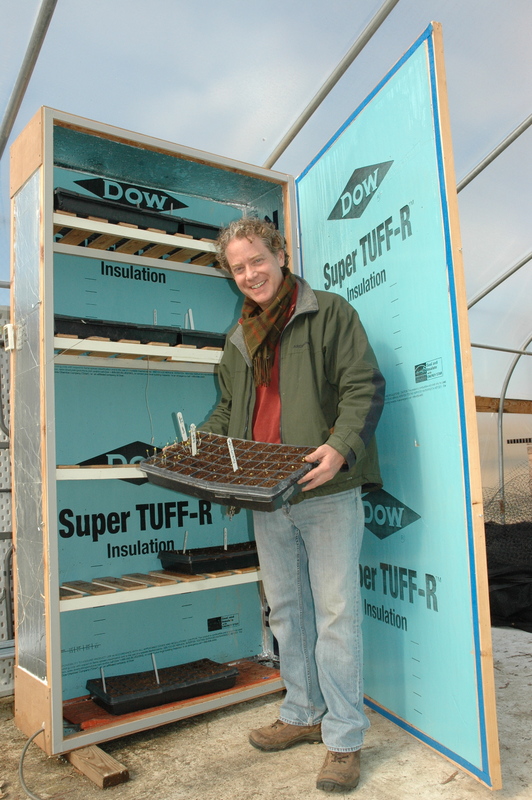 To coax and coddle seeds into sprouting and thriving in the nursery before they are allowed to burrow into the soil at one of the hoop houses, the farm’s staff has contrived two “incubators” from Forklift finds. The more high-tech invention is an upright cabinet designed to keep shelves of varnish from freezing with the heat of an incandescent light bulb. This insulated hotbox, retrofitted with a plug-in mat manufactured to warm baby pigs, can maintain temperatures between 50 degrees and 80 degrees. A few strides away, plastic trays of vulnerable vegetable plants are nested on a compost “crib” braced by straw bales from the Forklift. The mix of sawdust, chicken litter and food waste can generate enough heat to raise the temperature as high as 130 degrees, so it keeps the tiny greens toasty. The farm’s seedlings didn’t always have such a soft landing. It was, literally, a tough row to hoe back in 2010 when the first crops went into the ground. Generally, he explained, urban soils are pitifully short of the organic matter necessary to feed the bacteria that nurture plants. 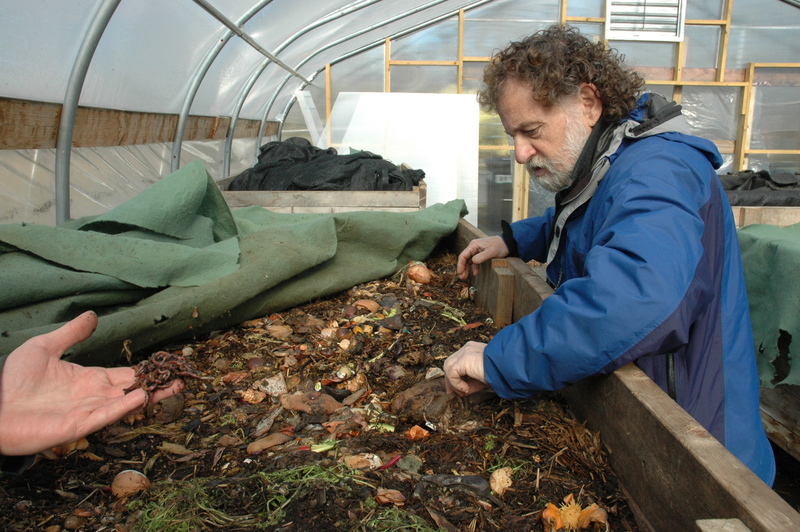 Erez uses the skills he stockpiled as the longtime manager of the University of Maryland Central Maryland Research and Education Center Compost Facility to continually bump up that organic matter shortfall. 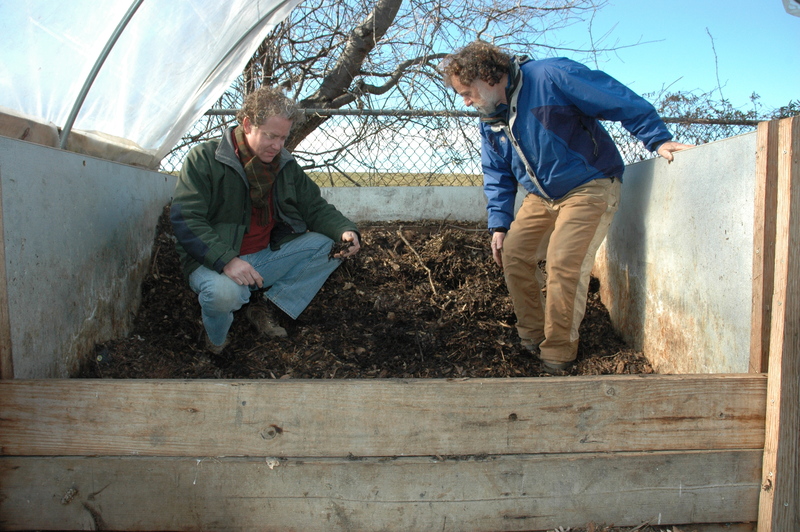 How does the compost guru do it? 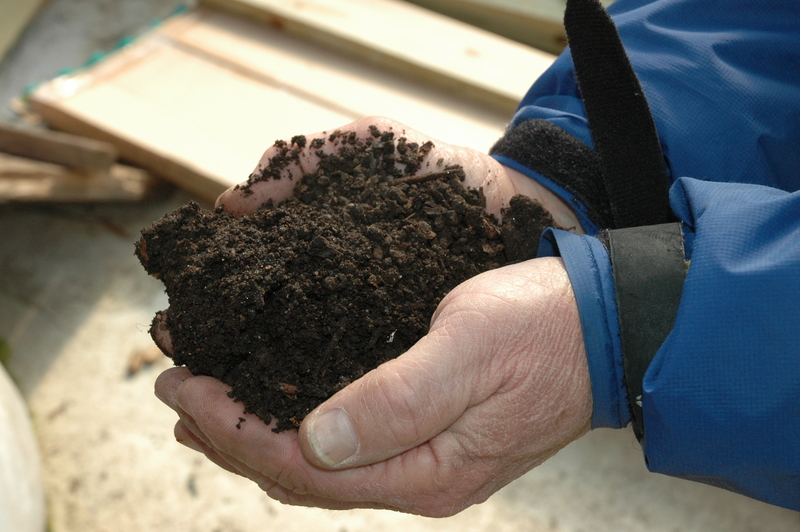 By crafting an elegantly simple, in-house operation to create soil. Part of it is an outside job, where various piles of food waste, chicken litter, leaves and straw are mixed according to an Erez-approved recipe so they’ll cook correctly. The other half is an inside job known as vermicomposting. Red wiggler worms in specially designed bins in the nursery help the process along by munching on the microbes that break down banana peels, apple cores, avocado pits, eggshells and more. Compost Cab, operated by a local entrepreneur, delivers 600 pounds of food scraps from area neighborhoods to ECO City Farms weekly. To fit with that theme, the centerpiece of the Edmonston farm is a shipping container painted mustard yellow with orange trim. The irony is that the rectangular metal box that once carried food all over the world has been recycled into a sleek commercial kitchen for a farm dedicated to filling stomachs in Prince George’s County. Features include a gas range from the Forklift and a walk-in refrigerator. Compost guru Benny Erez check out the compost bins where the red wiggler worms (in Matthew Carucci’s hand) work their magic in the nursery at ECO City Farms. Appropriately, the E-C-O of ECO City Farms is shorthand for Engaged Community Offshoots. With its federal, state and county funding, the nonprofit is intent on building a small network of area farms. With the Edmonston locale on its feet, next on the list is a farm in a low-income housing complex in Bladensburg. Morgan-Hubbard and her handful of staffers also are intent on educating families and policymakers about the promise, rewards and necessity of urban agriculture. “The idea is to build the next generation of farmers and activists,” said Morgan-Hubbard, who has dedicated her career to energy and environmental issues. One brilliant marketing move has been inviting hundreds of volunteers to help tend the nursery, gardens, beehives, ducks, geese and newly planted fruit orchard. Local schoolchildren receive hands-on lessons as well as some traditional instruction on a giant whiteboard from the Forklift hanging on the shipping container’s exterior. “We feel the food system in America is broken,” Erez said. “So much of our food comes all the way from California, and by then it’s a week old. ECO City Farms staffers harvested materials at Community Forklift to build this compost sifter. 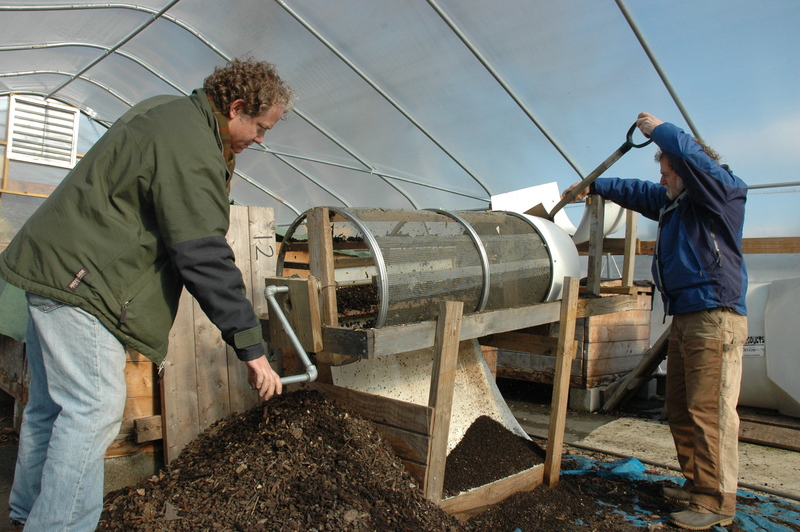 Here, apprentice Matthew turns the crank, while senior technical adviser Benny Erez, right, shovels compost into the device. Benny Erez holds the finished product. Nary a potato chip can be found in the farm’s kitchen on a recent Wednesday afternoon where a handwritten message on the whiteboard states: “Organic farmers have more fungi.” Melendez and John Costa, one of the farm’s apprentices, busy themselves sorting their recent harvest to prepare for the next day’s farmers market in Riverdale Park. Part of that chore includes filling 16 cloth bags with a variety of produce for the families who have ordered a weekly share of the farm’s bounty. This year, the farm will be growing 53 different types of vegetables and herbs. Melendez began farming while studying at the University of Maryland. His words reveal that he is indeed as content as he looks with his choice of livelihood. Staffers at ECO City Farms in Edmonston stand in front of a straw and compost “incubator” that nurtures seedlings in the plant nursery. From left to right, Benny Erez, Viviana Lindo, Margaret Morgan-Hubbard, Matthew Carucci, Christian Melendez and John Costa.